Strategic asset purchase expands portfolio and market reach with Roxwell and Westport pipe tobacco, tubes and filtered cigars. Inter-Continental Trading USA, Inc., manufacturer of the OHM, 752, Shargio and Kashmir brands, is pleased to announce the purchase of the Roxwell and Westport pipe tobacco, cigarette tube and filtered cigar brands. Inter-Continental Trading USA, Inc. is recognized as one of the top manufacturers of pipe tobacco, cigarette tubes and filtered cigars in the U.S. The purchase expands not only ICT’s portfolio, but also opens new sales channels and private label opportunities. The ROMAR Int’l. brands included in the purchase are Roxwell Pipe Tobacco, Roxwell Cigarette Tubes, Westport Pipe Tobacco and Westport Filtered Cigars. Terms of the deal were not disclosed. Inter-Continental Trading USA’s Shargio Patel shares his strategies for the future. Inter-Continental Trading was among the many manufacturers who enjoyed a banner year at the 2017 Tobacco Plus Expo in January, where founder and president Shargio Patel told Tobacco Business that business has been booming for his Mount Prospect, Illinois-based company, which manufactures and distributes a wide range of pipe tobacco, filtered cigars and cigarette tubes and accessories. 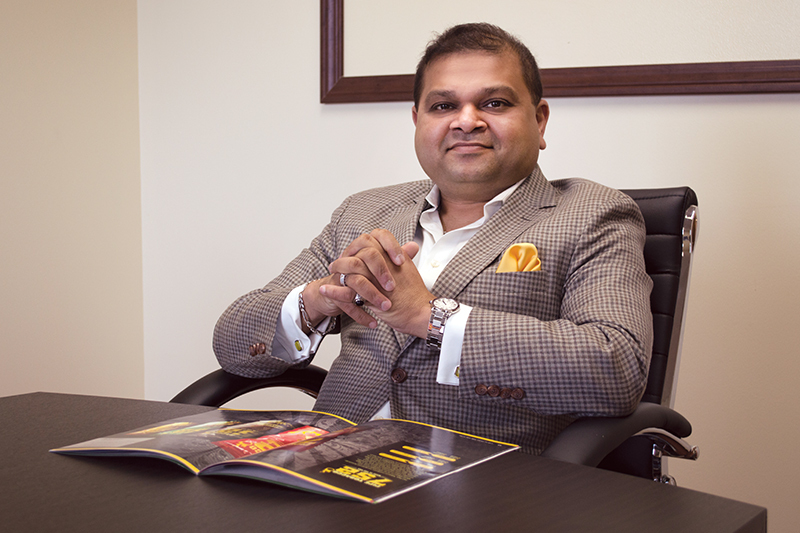 Recently, Tobacco Business connected with Patel to hear more about what’s new with Inter-Continental Trading USA, and what his plans are for the company’s future. Excerpts from that conversation follow. When we spoke at TPE 2017, you mentioned doing a lot of business at the show. Was that across categories or are some performing particularly well for you? All of our lines—pipe tobacco, filtered cigars and tubes—exceeded our expectations at the 2017 Tobacco Plus Expo. The OHM line of pipe tobacco has a large following, so our success at the show was attributed to both our existing clients and new customers getting more and more requests. You introduced Au Naturallé cigars in 2016. What prompted you to launch a new cigar and pipe tobacco line? With the demand for additive-free products continuing to grow, the Au Naturallé line fills a niche in the premium pipe tobacco and filtered cigar segments. On the business side, it also offers retailers the opportunity of higher margins and a brand that gets away from the “me-too” products prevalent in the marketplace. It’s been shown time and time again that consumers are willing to pay a little more for a product perceived as a higher quality. What distinguishes it from OHM, 752 and the rest of the offerings currently in the marketplace? What are your plans for its future? Au Naturallé completes our “Good, Better, Best” spectrum of product offerings. Where 752 fills the economy role and OHM has always been our flagship brand, Au Naturallé is the final piece that gives our customers a choice along all price points. There aren’t any concrete plans in the works, but I believe Au Naturallé would allow us an opportunity for more exotic blends. Your 752 brand of pipe tobacco and cigars is targeted at value-conscious smokers. How price-conscious are cigarette and cigar smokers? Regardless of the market segment, there will always be consumers looking for a high-quality, value product and smokers aren’t any different. Personally, I believe smokers are quality-driven first, then [price-driven]. That’s how we approached 752—the best blends at an affordable price. What are your goals for this brand going forward? How do you distinguish it from competing brands? We obviously want to see 752 grow and achieve the same success as OHM, so we are educating our client base and new customers on the line’s benefits. We differentiate 752 with dynamic packaging and marketing identity, whereas typical generic products don’t really stand out. What are your plans for the remainder of 2017? Do you have any new product launches or promotional campaigns planned? On the promotional side and new product launches, we are standing pat for the time being. We are waiting to see how the FDA regulations shake out and the effect they will have on the industry. This story first appeared in the May/June 2017 issue of Tobacco Business magazine. See OHM Au Naturall’e Filtered Cigars from Inter-Continental Trading USA Inc. at NACS! Inter-Continental Trading USA Inc.’s Au Naturall’e premium additive and preservative-free filtered cigars offer higher margins. CHICAGO – Premium products may comprise only a fraction of the little cigar market, but profit margins can be 8-10 times greater than that of value brands. With the proper mix between higher priced and economy-level products, retailers can maximize filtered cigar category profits without increasing rack space. OHM Au Naturall’e additive and preservative-free filtered cigars from Inter-Continental Trading USA offer c-stores a serious boost to sagging tobacco margins. Made in the USA, and available in four flavors—Red, (full-flavor), Gold, (mild), Perique, (spicy Louisiana Perique blend), and Menthol—Au Naturall’e Filtered Cigars are ideal for retailers looking for a premium, yet accessible line that meets the growing trend for natural products. Au Naturall’e Filtered Cigars are made from only the highest-quality, preservative and additive-free Golden Virginia tobacco blends. See Au Naturall’e Filtered Cigars from Inter-Continental Trading USA Inc. at NACS! Inter-Continental Trading USA Inc.’s Au Naturall’e filtered cigars offer higher margins. OHM Au Naturall’e additive and preservative-free filtered cigars from Inter- Continental Trading USA offer c-stores a serious boost to sagging tobacco margins. “While the filtered cigar segment continues to perform well,” said Shargio Patel, President of Inter-Continental Trading USA Inc., “there is a missed opportunity with higher-margin, premium brands. When it comes to all- natural products, consumers are willing to spend a little extra, and Au Naturall’e Filtered Cigars offer retailers a better return on those few inches of space." OHM Pipe Tobacco customers have a chance to win $250 in July. CHICAGO – Inter-Continental Trading USA Inc. has launched a Golden Ticket promotion in which OHM Pipe Tobacco customers have a chance to win $250. During the month of July, 30 specially marked bags of OHM 16oz-size Pipe Tobacco will contain a Golden Ticket worth $250. Over 1000 more packages will contain second prize coupons customers can use on their next purchase. Along with a Loyalty Rewards Point Program and a recent peel-off couponing campaign, the Golden Ticket promotion is part of a long-term effort by Inter-Continental Trading USA of focusing on maintaining and growing the OHM brand customer base. For more information on the Golden Ticket promotion or to see the rules, terms and conditions, please visit ictusainc.com/goldenticket. OHM, Au Naturall’e, 752 Pipe Tobacco and Shargio Tube customers can redeem points for swag. CHICAGO – Inter-Continental Trading USA Inc. has launched a new Loyalty Points Program in which customers can collect and redeem points for branded merchandise. Point values—located next to the UPC label-- can be found on each bag of OHM, Au Naturall’e and 752 Pipe Tobacco, 752 Filtered Cigars, as well as Shargio Tubes. After collecting a sufficient amount of points, customers can log on to www.ictusainc.com and click the “Rewards” tab or ICT Loyalty Points Program banner. From there, they will be directed to a page showing the available merchandise, as well as 3 easy steps to redeem their points. The Loyalty Points Program is the start of more consumer-focused roll-outs planned for ICT brands, and coincides with a website re-design. OHM, Au Naturall’e and 752 Pipe Tobacco from Inter- Continental Trading USA are made from only the finest American-grown tobacco blends. Inter-Continental Trading USA Inc., introduces a 1oz OHM Countertop Display option designed specifically for the convenience store channel. CHICAGO – After successfully rolling out groceries, and now seeing solid sales increases in foodservice offerings, C-stores are looking to further capture customers by adding more tobacco categories to the product mix. After closely monitoring these trends, Inter-Continental Trading USA Inc. is now offering a 1oz OHM Pipe Tobacco point-of- purchase solution. The 1oz OHM Pipe Tobacco Countertop Display comes preloaded with 15 bags—5 bags each of Red, Blue and Mint—in an attractive, yet space-saving 3-tier configuration. The 5” x 5” footprint takes up minimal counter space, while the 24” height commands attention. Convenient 144ct refill cases make reloading a snap. OHM Pipe Tobacco from Inter-Continental Trading USA is made from only the finest American-grown tobacco blends. Answering the demand for premium products, Inter-Continental Trading USA Inc.'s new offering uses only natural, preservative and additive-free Golden Virginia tobacco. CHICAGO – Almost 40% of Americans consume products labeled “all-natural” or having “natural ingredients.” Taking that cue and applying it to the $80 billion tobacco market, Inter-Continental Trading USA Inc. announces the release of Au Naturall'e Pipe Tobacco, an extension of the company's flagship OHM pipe tobacco line. Au Naturall’e is a specially blended, additive and preservative-free Golden Virginia tobacco, and contains an exclusive 2-way humidity control pouch in each mason jar-look bag for longer-lasting freshness. Au Naturall'e Pipe Tobacco is available in three varieties: Red (full flavor), Gold (mild), and Menthol, in both 1oz and 6oz re-sealable bags.